Highly publicized police shootings of young black men continue to fuel a national conversation on race. Groups such as Black Lives Matter have sought to highlight systemic racial inequality in the United States. Despite the achievements of the Civil Rights Movement over 50 years ago, many systemic inequalities persist — and some have worsened. An examination of educational attainment, wages, unemployment, incarceration rates, and other measures among black and white populations across U.S. cities reveals consistently worse outcomes among blacks. The wider the gaps, the more severe the level of inequality. 24/7 Wall St. reviewed 10 cities with the greatest inequality between whites and blacks. Valerie Wilson, director of the Program on Race, Ethnicity, and the Economy at the left-leaning think tank Economic Policy Institute, revealed an alarming trend. In a recent publication, Wilson found that even when age, regional factors, experience, and education levels are controlled for, the wage gap between black and white U.S. workers has widened over the past several decades. Eight of the 10 worst cities for black Americans are old industrial towns. In an interview with 24/7 Wall St. Wilson explained that the worsening racial wage gap across the nation and in these cities is related to broad macroeconomic trends such as the decline in manufacturing jobs. Partially because these occupations and others were once “the kinds of jobs that would have been available to people with less than a college degree,” in 1979 the smallest racial wage gap was in the Midwest. Today, racial disparities in Midwest cities remain the same or are worse than anywhere else in the country. Today, the unemployment rate among black U.S. workers is 11.3%, twice the 5.3% rate among white workers. The two-to-one unemployment disparity, which is even larger in some areas, gives a snapshot of the vastly different means white and black Americans have of providing basic material needs. This one economic disparity is driven by and helps perpetuate other racial inequalities — from the proliferation of crime to disparate health outcomes to wage and wealth gaps. The racial wealth gap is especially wide. In the 2015 study, Exploring the Racial Wealth Gap Using the Survey of Consumer Finances, researchers at the Federal Reserve Board found that the median net worth of white families in the United States is $134,000. The median net worth of black families, at $11,000, is a fraction of that amount. Homes are by far the largest investment most Americans make, and the substantial disparity in homeownership rates between racial groups helps explain this wealth gap. Nationally, 68.5% of white individuals and families live in homes they own compared to a black homeownership rate of 40.9%. In the majority of the metro areas on this list, white homeownership is greater than 70%, while the black homeownership rate is less than 35%. The 13th amendment officially abolished slavery in the United States. While progress has been made over the years, in one area — incarceration and imprisonment — it seems inequality has worsened. As Wilson explained, the tough-on-crime era over the course of the ongoing war on drugs has disproportionately affected young black men. White and black incarceration rates have always been very different, but during that time the imprisonment of black individuals increased dramatically, and it continues today. For every 100,000 white people, there are 275 in U.S. prisons. By contrast, the incarceration rate among black Americans is 1,408 per 100,000 African Americans. In most of the cities on this list, the white incarceration rates are lower than the national rate, while the black incarceration rates are higher than the respective national rate. Certain policies have also contributed to the lopsided racial incarceration rates. For example, under the broad set of policies known as the war on drugs, offenses related to crack cocaine, a drug more common among black drug users, require harsher sentences than offenses related to powdered cocaine, a drug more common among white drug users. The separately classified drugs, however, are essentially the same substance. 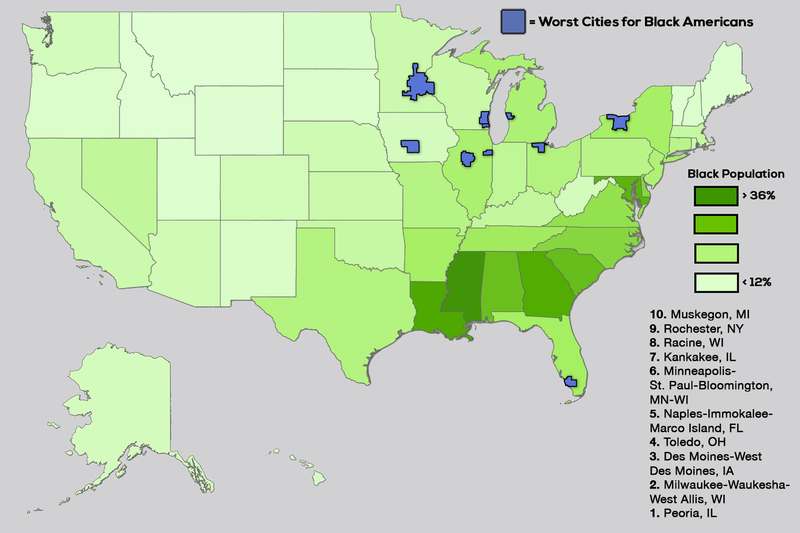 Click here to see the worst cities for black Americans. Click here to read our methodology.